What tech can’t you live without? | "geeWHIZ"
I can honestly answer, all of the above. Well, just one device has all of the above. It’s my mobile phone, as known as a cellular phone. It’s also the one device that does all of the above. My phone is more than just a phone, with its directory of all my friends and family. It’s my business contact manager. It’s my universal communicator with its text, voice, and file attachment capabilities. And, it’s my instant link to my social networks (Facebook, Twitter, LinkedIn, tumblr). My phone is also my source of spiritual strength. No, I don’t worship my phone. 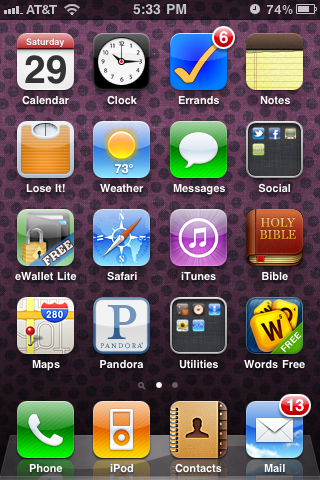 I have YouVersion, my online Bible, with all its translations, daily reading plans, and bookmarks. I’m given daily pop-up reminders of the next chapters and verses to read to stay up with my goal (to read the entire Bible in one year). My phone is my satellite radio, thanks to Pandora radio, iTunes, and other online music sources. My phone is also my eBook reader, storing podcasts, eBooks and Web pages to read later. My phone is also my backup digital camera. On the very rare occasion that I’m not packing my DSLR with lenses and speedlite in its slingbag, I’m still able to capture that visual moment, that image, that memory. My phone is also my hand-held gaming device, thanks to iTunes’ app store and its access to downloadable games. “Words with Friends,” anyone? My phone is also my universal translator, thanks to Word Lens. Spanish to English and back again. My phone is also my transporter device. Scotty. Energize. This entry was posted in Blogging, Facebook, Health, Personal, PostaWeek2011, Social media, Technology, Twitter, Writing and tagged postaweek2011, Wellness by geewhizkid. Bookmark the permalink. Saw this prompt from WordPress and thought it a difficult one to answer. I love my tech stuff. Top of the List: My cellphone, My MacBook, My Digital Camera…. You know, my “Smart Phone” was the first thing that came to mind when answering this question. I do feel lost without it! But then I think, am I just spoiled? If I turned the thing off for a week, I would probably get by (though) I might suffer some withdrawal. Maybe the tech I can’t live without is a little more basic – like electricty. The fuel for everything else. I think I would have more dire problems if I couldn’t turn the lights on, or keep the food in my fridge cold.